Now, peptic ulcer disease only infrequently requires surgery although it was once the most common indication for gastric surgery. Over the past several decades, the development of potent antisecretory agents (initially histamine-2 [H2] blockers and then proton pump inhibitors [PPI]) and the recognition that eradication of Helicobacter pylori infection (medical equivalent of vagotomy) can eliminate most ulcer recurrences have relegated definitive surgery to the chapters of surgical textbooks. Combinations of multiple antibiotics, coupled with acid-reducing agents, usually PPIs, have been the mainstay of these regimens. With these regimens, cure rates >80% (intent to treat) have been reported. First introduced in the late 1980s (introduction of omeprazole in 1989), PPIs have demonstrated gastric acid suppression superior to that of histamine H2-receptor blockers and, hence, are currently the main therapy for gastroesophageal reflux disease, peptic ulcer disease, nonulcer dyspepsia, and prevention of gastropathy while using nonsteroidal anti-inflammatory drugs (NSAIDs). The broad spectrum of indications, high efficacy, and a favorable safety profile have made them one of the most frequently used pharmaceuticals worldwide. In fact, the favorable safety profile has led to some of these agents becoming available over the counter. However, as the use of PPIs has expanded, there have been concerns about safety and are being looked at more critically. The most common unwanted effects reported are headaches, abdominal pain, and diarrhea; however, other more serious, though uncommon, adverse effects are now being reported. Patients with chronic kidney disease (CKD) and end-stage renal disease (ESRD) often have gastrointestinal (GI) complications, such as chronic bleeds, gastritis, ulcers, nausea, vomiting, gastroesophageal reflux disease, and stasis.,,, Given their predominantly hepatic metabolism, PPIs are also easy to use in patients with reduced kidney function. According to a review of the use of medicines in the United States in 2013, more than 15 million Americans used prescription PPIs in 2013, costing more than $10 billion US dollars, with an additional unknown quantity of users of over-the-counter (OTC) PPIs. Specifically, in patients with kidney disease, a small study suggested a high consumption of acid-suppressing therapy (AST), 93% of which were PPIs in patients on dialysis (compared to other chronic diseases and hospitalized patients). The use of AST had, in the majority (63%) of cases, no adequate indication. Majority of patients with a chronic illness—CKD, pulmonary disease, or rheumatic disease—were on long-term AST (>8 weeks). Empiric PPI treatment of uninvestigated dyspepsia in patients younger than 45 years old without alarming symptoms may be a cost-effective and safe approach. However, the mean age in this study population was 65 years, suggesting possible underuse of diagnostic endoscopy and overuse of PPIs. In the dialysis literature, the Dialysis Outcomes and Practice Patterns Study data (8628 prevalent patients in 308 dialysis facilities) showed a relatively consistent overall prescription rate of about 36% to 38% of AST, suggesting that prescription rates in this population are several times greater than in the general population. The prescription of H2-blockers has experienced an overall decline, mirrored by an increase of a similar magnitude in the prescription of PPIs. There was a large variation in the extent of prescription of the different ASTs, both between countries and within different facilities. Facility use of H2-blockers and PPIs ranged from 0% to 94% of patients, suggesting that there is no standard approach in treatment practices. There were strong associations between GI medication prescription and several comorbidities and concomitant medications. It has been speculated that the overuse in patients with CKD may be related to polypharmacy, comorbidities, hypergastrinemia, or the involvement of many physicians in their care. PPIs are generally well tolerated with a frequency of adverse effects similar to that of placebo, and an overall incidence of <5%. The type and frequency of adverse effects are similar to those observed with H2-receptor blockers. The most common adverse effects are headache, diarrhea, abdominal pain, and nausea. Except for diarrhea, the adverse effects of PPIs do not appear to be related to age, dosage, or duration of treatment. Diarrhea might be related to the profound acid suppression, which has been shown to alter the bacterial content of the gut from colonization by ingested pathogens. Nevertheless, the overall incidence of diarrhea is <5%, and this effect appears to be dose and age related. The short-term safety of all the PPIs has been well established. PPIs are only contraindicated if the patient has a known history of hypersensitivity to them.,, Omeprazole is a pregnancy Category C agent; the others are pregnancy Category B medications. PPIs are not recommended in breast-feeding mothers.,,,, Unfortunately, for adverse effects which are uncommon, or occur after a longer duration of action, premarketing Phase 3 studies are not helpful. The role of postmarketing surveillance (so-called pharmacovigilance) is hence critical. For PPIs, several recent observational studies have linked their use to hip fracture, community-acquired pneumonia, and clostridium difficile infections  and more recently dementia, apart from the kidney problems. In 1992, a sentinel case report identified the PPI omeprazole as a possible cause of acute interstitial nephritis (AIN) in an elderly woman. Overall, the available studies suggest that AIN (of any cause) accounts for about 6%–8% of cases of acute renal failure., The diagnosis of AIN is most common in renal failure with an inactive urinary sediment (no hematuria or proteinuria); in this setting, it has been reported to occur in 27% of cases. In contrast, AIN occurs in 1% of renal biopsies performed for the evaluation of hematuria or proteinuria . While AIN is most often induced by medications (this accounts for over two-thirds of cases), it can also be due to infections, tubulointerstitial nephritis and uveitis syndrome, sarcoidosis, or it may be idiopathic., Among the most commonly implicated medications are antibiotics, especially quinolones, NSAIDs, diuretics, and more recently PPIs . PPI-induced interstitial nephritis is an idiosyncratic reaction of hypersensitivity to the medication or its metabolites and is not related to the dosage. In a systematic review in 2007, looking at the development of interstitial nephritis and acute renal failure (determined by laboratory tests [creatinine and/or glomerular filtration rate, plus either renal biopsy or recurrence upon reinitiating PPI]), 64 cases (60% females, mean age 78 years, published in the 15 years before this review) of PPI-associated interstitial nephritis were found, of which 60 were included (59 confirmed by renal biopsy, one by recurrence upon reinitiating PPI). The most common symptoms were nonspecific, such as nausea and malaise. All the PPIs available were implicated. The interval between PPI initiation and AIN ranged from 2 to 52 weeks though about two-thirds were within 12 weeks. Three of the 60 cases (5%) required dialysis though only one remained on permanent dialysis. Although renal function recovered in the others, the postrecovery creatinine was higher, suggesting an element of chronic irreversible damage. A large, retrospective, nested case–control study  sought to determine whether an association exists between renal injury and PPI use and, in turn, estimate an effect size for this association using data from an insurance database of a single midwestern state (Nebraska, USA). Patients included in the study were 18 years or older, diagnosed with renal disease for at least 12 months, and continuously enrolled with the insurer for at least 24 months between September 2002 and November 2005. PPI exposure status was obtained through prescription claims. Renal disease was defined on the basis of the International Classification of Diseases, Ninth Revision codes, and included codes for both acute and CKD. PPI use was positively associated with renal disease (odds ratio [OR]: 1.72, 95% confidence interval [CI]: 1.27–2.32, P< 0.001) even after controlling for potential confounding conditions, providing the first estimate of an effect size for this association. After excluding patients with potential confounding disease states from the study population, the relationship between renal disease and PPI use remained consistent (OR: 2.25, CI: 1.09–4.62, P< 0.001). The inclusion of a propensity score in the model did not change the relationship between PPI use and renal disease (OR: 2.05, CI: 1.52–2.72). Analyses of H2-blockers showed that a statistically significant relationship between H2-blocker use and renal disease was not present (OR: 1.37, CI: 0.46–4.13). A subsequent population-based cohort study, in Ontario, Canada, involving nearly 600,000 patients used propensity score matching to establish a highly comparable reference group of control patients. Apart from excluding patients with other concomitant potentially contributing illnesses, individuals newly prescribed other medications associated with AIN, including NSAIDs, loop and thiazide diuretics, anticonvulsants, and H2-receptor antagonists, were also excluded from the study. Those who commenced treatment with PPIs had a more than two-fold increase in rates of acute kidney injury (AKI) (13.49 vs. 5.46 per 1000 person-years, respectively; hazard ratio [HR]: 2.52, 95% CI: 2.27–2.79) and AIN (0.32 vs. 0.11 per 1000 person-years; HR: 3.00, 95% CI: 1.47–6.14) in hospital admission diagnoses. With sensitivity analyses, a similar increase in the risk of AKI was seen among patients receiving PPIs when censoring patients on admission to hospital for infection (HR: 2.52, 95% CI: 2.27–2.79) or on receipt of other drugs (e.g., antibiotics) classically associated with AIN (HR: 4.03, 95% CI: 3.29–4.92). The respective HRs for AIN were 3.22 (95% CI: 1.53–6.81) and 3.25 (95% CI: 1.06–9.97). Similar results were found in an analysis stratified by individual PPIs, substantiating the class effect. There was no meaningful association between PPI use and cataract surgery (HR: 0.97, 95% CI: 0.93–1.00) – the null association enhancing the causal inference. In addition, more than half (59%) of the patients in this study, on discharge from the hospital, received another prescription for a PPI in the ensuing 100 days. Of these patients, 7.5% were readmitted to hospital with AKI in the ensuing 120 days, consistent with a causal role of PPIs in some instances, providing the first estimate of the risk of drug rechallenge. This also highlights the lack of awareness among clinicians of the potential association between these drugs and renal disease. A recently published article in JAMA looked at PPI use and the risk of CKD in two large cohorts, 10,482 participants in the Atherosclerosis Risk in Communities (ARIC) study group and 248,751 patients in the Geisinger Health System. In the ARIC study, PPI use was associated with incident CKD in unadjusted analysis (HR: 1.45; 95% CI: 1.11–1.90); in the analysis adjusted for demographic, socioeconomic, and clinical variables (HR: 1.50; 95% CI: 1.14–1.96); and in the analysis with PPI ever use modeled as a time-varying variable (adjusted HR: 1.35; 95% CI: 1.17–1.55). The association persisted when baseline PPI users were compared directly with H2-receptor antagonist users (adjusted HR: 1.39; 95% CI: 1.01–1.91) and with propensity score-matched nonusers (HR: 1.76; 95% CI: 1.13–2.74). The 10-year estimated absolute risk of CKD among the baseline PPI users was 11.8% while the expected risk had they not used PPIs was 8.5% (absolute risk difference, 3.3%, which would correspond to a number needed to harm of only 30). In the Geisinger Health System replication cohort, PPI use was significantly associated with incident CKD in unadjusted analyses (HR: 1.20; 95% CI: 1.15–1.26; P< 0.001), in adjusted analyses (adjusted HR: 1.17; 95% CI: 1.12–1.23; P< 0.001), and when estimated using a time-varying ever-use model (adjusted HR: 1.22; 95% CI: 1.19–1.25; P< 0.001). Twice-daily PPI dosing (adjusted HR: 1.46; 95% CI: 1.28–1.67; P< 0.001) was associated with a higher risk of CKD than once-daily dosing (adjusted HR: 1.15; 95% CI: 1.09–1.21; P< 0.001). The 10-year absolute risk of CKD among the baseline PPI users was 15.6%, and the expected risk had they not used PPIs was 13.9% (absolute risk difference, 1.7%, corresponding to a number needed to harm of 59). The use of H2-receptor antagonists was not associated with increased risk of incident CKD in either cohort (adjusted HR: 1.15; 95% CI: 0.98–1.36; P = 0.10 in the ARIC study and adjusted HR: 0.93; 95% CI: 0.88–0.99, P = 0.03 in the replication cohort). 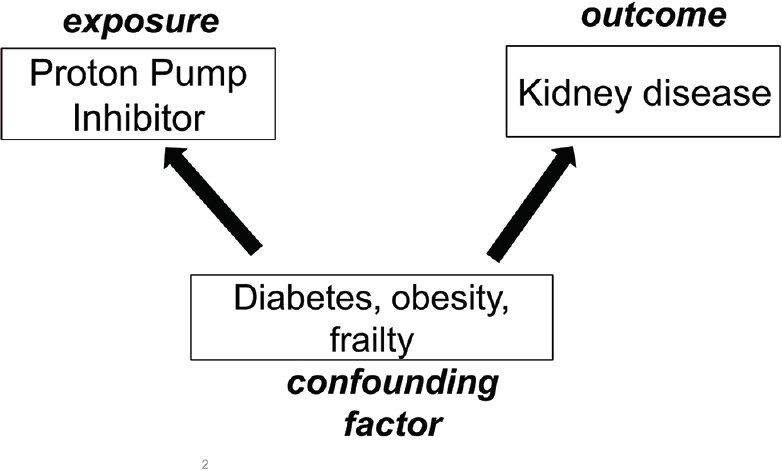 This study provides a first possible association between use and incident CKD. In the same study, PPI use also resulted in a higher risk of incident AKI. Twice-daily PPI dosing (adjusted HR: 1.62; 95% CI: 1.32–1.98; P< 0.001) was associated with a higher risk of AKI than once-daily dosing (adjusted HR: 1.28; 95% CI: 1.18–1.39; P< 0.001) showing a biological gradient. The finding of the link between PPI and incident CKD was corroborated in a study of about 200,000 veterans. In adjusted Cox survival models, users of PPIs compared with H2-blocker users  had an increased risk of incident estimated glomerular filtration rate (eGFR) <60 ml/min per 1.73 m 2 and of incident CKD (HR: 1.22; 95% CI: 1.18–1.26; and HR: 1.28; 95% CI: 1.23–1.34, respectively). Patients treated with PPI also had a significantly elevated risk of doubling of serum creatinine level (HR: 1.53; 95% CI: 1.42–1.65), of eGFR decline >30% (HR: 1.32; 95% CI: 1.28–1.37), and of ESRD (HR: 1.96; 95% CI: 1.21–3.18). Furthermore, they detected a graded association between duration of PPI exposure and risk of renal outcomes among those exposed to PPI for 31–90, 91–180, 181–360, and 361–720 days compared with those exposed for ≤30 days. Finally, a small, single-center retrospective study published this year (2016) also linked PPI use to a higher risk of biopsy-proven acute rejection in kidney transplant recipients (16/171, 9.4% vs. 3/113, 2.6%; P = 0.03). Magnesium (Mg), one of the most abundant elements on the Earth and the fourth most abundant cation in the human body, is an integral part of ATP, nucleic acids, and a cofactor to hundreds of enzymes. As it is excreted by the kidneys, its level rises with declining kidney function, and in dialysis patients, dialysate Mg plays a critical role in Mg homeostasis. Of interest to the renal community has been the association between PPIs and hypomagnesemia, which was again substantiated in a population-based cohort study in the general population (involving 9,818 individuals), which showed PPI use was associated with increased risk of hypomagnesemia (OR: 2.00; 95% CI: 1.36–2.93) compared to no use. Effect modification was found between the use of PPIs and loop diuretics; in participants using loop diuretics, PPI use was associated with a further increased risk of hypomagnesemia (OR: 7.22; 95% CI: 1.69–30.83) compared to no use. The increased risk with PPIs was only seen after prolonged use (range, 182–2618 days; OR: 2.99; 95% CI: 1.73–5.15). To analyze whether PPI-induced hypomagnesemia could be explained by confounding by indication, sensitivity analyses were performed with serum phosphate level, dietary Mg intake, and use of vitamin and mineral supplementation. No significant association was found between PPI use and serum phosphate level (0.006 [95% CI: 0.028–0.040] mg/dl) compared to no use, suggesting that the indication for PPIs did not result in poor dietary intake and, therefore, lower serum Mg and phosphate levels. Including dietary Mg intake into the model also did not alter results. The basis for the Mg-lowering effect of PPIs has yet to be fully elucidated; the finding of low urinary Mg levels suggests that Mg depletion occurs in the GI tract. While passive absorption accounts for most of the GI Mg uptake, carrier-mediated pathways involving TRPM-6 (transient receptor potential cation channels) and TRPM-7 are also known to be critical to GI Mg homeostasis. While it has been suggested that the major mechanism by which PPIs induce Mg wasting is through TRPM-6 and TRPM-7 inhibition  (caused by changes in intestinal pH), there is also some evidence that interference with the passive absorption mechanism may underlie this phenomenon. To support this, a recent cross-sectional study  conducted in hemodialysis patients with minimal residual renal function revealed that PPI use was associated with lower serum Mg levels as compared with nonusers (even after stratifying for dialysate Mg concentration). Severe hypomagnesemia may result in tetany, convulsions, or cardiac arrhythmias. Mild hypomagnesemia is often asymptomatic, but it may still be relevant as population studies have shown that even mild hypomagnesemia is associated with increased risk of diabetes mellitus, osteoporosis, cardiovascular disease,, and mortality. In addition, in another report from the ARIC study, low serum Mg levels (0.7 mmol/L or less) had significant associations with incident CKD and ESRD compared with the highest quartile with adjusted HR of 1.58 (95% CI: 1.35–1.87) for CKD and 2.39 (95% CI: 1.61–3.56) for ESRD. These associations remained significant after excluding users of diuretics and across subgroups stratified by hypertension, diabetes, and self-reported race. Previous studies have suggested that serum Mg may influence kidney function through the regulation of vascular and endothelial function. The rate of circulating Mg transport into a cell varies depending on tissue and cell type. The endothelial cell, which expresses the Mg transporter TRPM7, may be more readily influenced by circulating Mg.In vitro studies have shown that low extracellular Mg levels inhibit endothelial cell proliferation  and promote the expression of inflammatory biomarkers. Low Mg levels have also been shown to promote vascular calcification in both in vitro and in vivo studies. Further, serum Mg levels may affect the endothelium through a thrombotic process since low circulating Mg levels increase platelet aggregation  and have a prothrombotic effect in animal studies. Chronic inflammation and hemostatic biomarkers have also been linked to kidney function decline. Overall, some of these effects may underlie the adverse clinical outcomes reported with hypomagnesemia, including the renal effects. Finally, PPI-induced hypomagnesemia is also relevant to ESRD patients. Three large observational studies ,, have reported a strong association between hypomagnesemia and mortality in hemodialysis patients despite controlling for a swath of confounders. Although not all the hypomagnesemia seen in ESRD patients is definitively from PPI, PPI overuse could certainly be playing a role in some patients. Most of the studies discussed are observational, cohort, or cross-sectional studies [Table 2] which can only show an association and, hence, cannot prove causality between PPI use and AKI/CKD or hypomagnesemia. Participants who are prescribed PPIs may be at a higher risk of CKD/AKI for reasons unrelated to their PPI use. For example, PPI users in both ARIC study and replication cohort in the JAMA study were more likely to be obese, have a diagnosis of hypertension, and carry a greater burden of prescribed medications. The use of adjustment with regression, and even more so with propensity score matching, attenuates the effect of confounding; however, some elements of residual confounding may still be present [Figure 1]. Indeed, the associations of PPI use with multiple clinical outcomes, apart from the renal issues, such as fractures, diarrhea, and dementia, may only be representative of the PPI use being a marker for a patient phenotype at high risk for adverse outcomes. Even with AIN, cause and effect is not always easy to prove, given that most patients are on multiple drugs. The effect of rechallenge, reported in one of the studies, with 7.5% developing AKI again, is a more specific measure. Conversely, baseline users may represent a special group of PPI users who tolerate the medication without the development of CKD leading to selection bias. In recent years, PPIs have become available over the counter. Therefore, medication exposure may have been misclassified, with an unknown proportion of patients in the nonexposed (or control) group also taking a PPI. This would bias an analysis toward the null, thus strengthening the validity of association reported. Other OTC medication use is also not captured, importantly NSAIDs. It is indeed quite plausible that PPI use also associates with NSAID use, and the increase in risk of AKI/CKD reported with PPI use is partly due to underlying NSAID use. Surveillance bias (disease ascertainment) may be better in the monitored population than in the general population and could overestimate the impact of PPI exposure, especially with the relatively soft outcome of GFR < 60, as was used in the ARIC study. Many of the studies used hospital diagnosis codes, which have limited sensitivity, particularly for milder forms of the condition (AKI/CKD), which are less sensitive, and may indeed underestimate the true incidence and association. In addition, they relied on administrative data and, hence, had no access to laboratory indices of renal function, renal biopsy results, and treatment indication or medication adherence. Similarly, with respect to the association of serum Mg, Mg is also closely associated with serum potassium, phosphate, albumin, and poor nutrition. Hence, although the association between Mg and mortality was attenuated and remained significant after adjustment in the studies, there could be residual confounding from other unmeasured factors at play. However weak the association between PPI use and kidney disease, it is rational to use PPI only when indicated and only for as long as indicated. Current data indicate that PPIs are often used when unnecessary, for longer than necessary, and on occasion when an H2-blocker might be sufficient. In addition, PPIs do not always need to be prescribed on a continuous basis and could also be sometimes used on an as-needed basis. Pharmacological debridement, in the form of deprescribing, can be a valuable tool in the hands of not only the nephrologist but also the general practitioners. 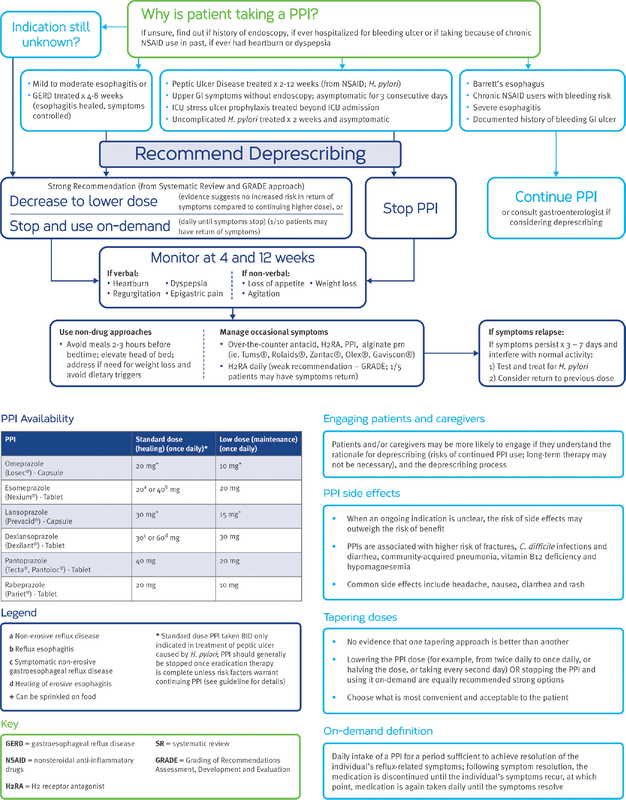 [Figure 2] shows an algorithm that could be used to evaluate PPI use and aid in deprescribing. The favorable safety profile of PPIs is perhaps not so favorable with reports of uncommon adverse outcomes being regularly reported [Figure 3]. Observational cohort studies represent one of the best methods to study adverse effects of medications used in real-world settings. Given the millions of individuals who take PPIs each year and the fact that more than half of such prescriptions may not be clinically indicated, even a small absolute increase in risk of AKI/CKD may outweigh any benefit that might be derived from overuse of these drugs in many patients for whom they are prescribed. AIN is not preventable due to its idiosyncratic nature; therefore, it is important that emphasis is placed on timely recognition. Although it should not deter clinicians from prescribing PPIs for patients with well-defined indications and durations, the current evidence underscores the importance of ongoing efforts to curtail the indiscriminate use of these drugs. Discontinuation of inappropriately prescribed PPIs would have great economic implications leading to a reduced economic burden for health-care providers. Given the significant association of hypomagnesemia with mortality in our patients, it would be prudent to avoid any preventable cause, in this case, PPI-induced hypomagnesemia. Several questions remain unanswered. If PPIs do have a direct causal role in the development of CKD, what could be the exact mechanism of CKD due to PPI use? Is it due to repeated episodes of AKI, or a hitherto unreported “chronic interstitial nephritis,” or perhaps related to hypomagnesemia? Studies are needed to determine whether modification of serum Mg levels (and to what targets) might alter subsequent incident kidney disease rates and other hard outcomes such as mortality/hospital admissions. Church NC, Palmer KR. Acute non-variceal upper gastrointestinal haemorrhage treatment. In: McDonald J, Burroughs A, Feagan B, editors. Evidence Based Gastrology and Hepatology. London: BMJ Books; 1999. p. 118-38. Ostrow B. Peptic Ulcer Disease – The Impact of Helicobacter pylori on Management in the Developing World. SIA; April, 2007. Hess MW, Hoenderop JG, Bindels RJ, Drenth JP. Systematic review: Hypomagnesaemia induced by proton pump inhibition. Aliment Pharmacol Ther 2012;36:405-13. Wickersham RM, Novak KK. Drug Facts and Comparisons. St. Louis, MO: Wolters Kluwer Health, Inc.; 2005. Fallone CA, Mayrand S. Gastroesophageal reflux and hyperacidity in chronic renal failure. Perit Dial Int 2001;21 Suppl 3:S295-9. Wasse H, Gillen DL, Ball AM, Kestenbaum BR, Seliger SL, Sherrard D, et al. Risk factors for upper gastrointestinal bleeding among end-stage renal disease patients. Kidney Int 2003;64:1455-61. Cekin AH, Boyacioglu S, Gursoy M, Bilezikci B, Gur G, Akin ED, et al. Gastroesophageal reflux disease in chronic renal failure patients with upper GI symptoms: Multivariate analysis of pathogenetic factors. Am J Gastroenterol 2002;97:1352-6.
de Francisco AL. Gastrointestinal disease and the kidney. Eur J Gastroenterol Hepatol 2002;14 Suppl 1:S11-5. IMS Institute for Healthcare Informatics. Medicine Use and Shifting Costs of Healthcare: A Review of the Use of Medicines in the United States in 2013; April 2014. Available from: http://www.imshealth.com/cds/imshealth/Global/Content/Corporate/IMS%20Health%20Institute/Reports/Secure/IIHI_USUse_of_Meds_for_2013.pdf. [Last accessed on 2015 Jun 19]. Strid H, Simrén M, Björnsson ES. Overuse of acid suppressant drugs in patients with chronic renal failure. Nephrol Dial Transplant 2003;18:570-5. Bailie GR, Mason NA, Elder SJ, Andreucci VE, Greenwood MN, Akiba T, et al. Large variations in prescriptions of gastrointestinal medications in hemodialysis patients on three continents: The Dialysis Outcomes and Practice Patterns Study (DOPPS). Hemodial Int 2006;10:180-8. Korman MG, Laver MC, Hansky J. Hypergastrinaemia in chronic renal failure. Br Med J 1972;1:209-10. Playford RJ, Podas T, Modlin I. Pantoprazole, Prout and the proton pump. Hosp Med 1999;60:500-4. Welage LS, Berardi RR. Evaluation of omeprazole, lansoprazole, pantoprazole, and rabeprazole in the treatment of acid-related diseases. J Am Pharm Assoc (Wash) 2000;40:52-62. Williams MP, Pounder RE. Review article: The pharmacology of rabeprazole. Aliment Pharmacol Ther 1999;13 Suppl 3:3-10. Prakash A, Faulds D. Rabeprazole. Drugs 1998;55:261-7. Reilly JP. Safety profile of the proton-pump inhibitors. Am J Health Syst Pharm 1999;56 23 Suppl 4:S11-7. Franko TG, Richter JE. Proton-pump inhibitors for gastric acid-related disease. Cleve Clin J Med 1998;65:27-34. Langtry HD, Wilde MI. Lansoprazole. An update of its pharmacological properties and clinical efficacy in the management of acid-related disorders. Drugs 1997;54:473-500. Omeprazole (Prilosec). Package Insert. Wayne, PA: Astra Pharmaceuticals; 1998. Available from:http://www.azpicentral.com/prilosec/prilosec.pdf#page=1. [Last retrieved on 2016 Aug 29]. Lansoprazole (Prevacid). Package Insert. Deerfield, Ill.: TAP Pharmaceuticals; 1999. Available from: http://www.abbott.ca/docs/PREVACID-PM-E.pdf. [Last retrieved on 2016 Aug 29]. Rabeprazole (Aciphex). Package Insert. Titusville, NJ: Janssen Pharmaceuticals; 1999. Available from:http://www.aciphex.com/pdf/aciphexpi.pdf. [Last retrieved on 2016 Aug 29]. Pantoprazole (Protonix). Package Insert. Philadelphia, PA: Wyeth-Ayerst; 2000. Available from: http://labeling.pfizer.com/ShowLabeling.aspx?id=135. [Last retrieved on 2016 Aug 29]. Esomeprazole (Nexium). Package Insert. Wilmington, Del. : Astra Pharmaceuticals; 2001. http://www.azpicentral.com/nexium-i-v/nexium_iv.pdf#page=1. [Last retrieved on 2016 Aug 29]. Yang YX, Lewis JD, Epstein S, Metz DC. Long-term proton pump inhibitor therapy and risk of hip fracture. JAMA 2006;296:2947-53. Lambert AA, Lam JO, Paik JJ, Ugarte-Gil C, Drummond MB, Crowell TA. Risk of community-acquired pneumonia with outpatient proton-pump inhibitor therapy: A systematic review and meta-analysis. PLoS One 2015;10:e0128004. Dial S, Alrasadi K, Manoukian C, Huang A, Menzies D. Risk of Clostridium difficile diarrhea among hospital inpatients prescribed proton pump inhibitors: Cohort and case-control studies. CMAJ 2004;171:33-8. Gomm W, von Holt K, Thomé F, Broich K, Maier W, Fink A, et al. Association of Proton pump inhibitors with risk of dementia: A pharmaco epidemiological claims data analysis. JAMA Neurol 2016;73:410-6. Ruffenach SJ, Siskind MS, Lien YH. Acute interstitial nephritis due to omeprazole. Am J Med 1992;93:472-3. Torpey N, Barker T, Ross C. Drug-induced tubulo-interstitial nephritis secondary to proton pump inhibitors: Experience from a single UK renal unit. Nephrol Dial Transplant 2004;19:1441-6. Davison AM, Jones CH. 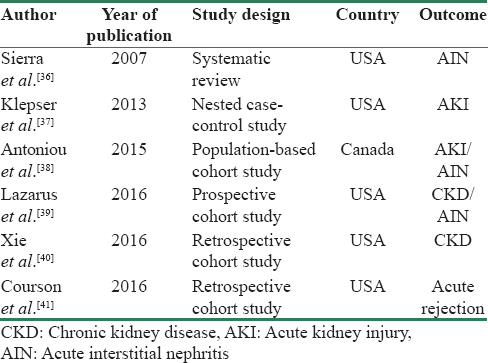 Acute interstitial nephritis in the elderly: A report from the UK MRC glomerulonephritis register and a review of the literature. Nephrol Dial Transplant 1998;13 Suppl 7:12-6. Farrington K, Levison DA, Greenwood RN, Cattell WR, Baker LR. Renal biopsy in patients with unexplained renal impairment and normal kidney size. Q J Med 1989;70:221-33. Kodner CM, Kudrimoti A. Diagnosis and management of acute interstitial nephritis. Am Fam Physician 2003;67:2527-34. Baker RJ, Pusey CD. The changing profile of acute tubulointerstitial nephritis. Nephrol Dial Transplant 2004;19:8-11. Sierra F, Suarez M, Rey M, Vela MF. Systematic review: Proton pump inhibitor-associated acute interstitial nephritis. Aliment Pharmacol Ther 2007;26:545-53. Klepser DG, Collier DS, Cochran GL. Proton pump inhibitors and acute kidney injury: A nested case-control study. BMC Nephrol 2013;14:150. Antoniou T, Macdonald EM, Hollands S, Gomes T, Mamdani MM, Garg AX, et al. Proton pump inhibitors and the risk of acute kidney injury in older patients: A population-based cohort study. CMAJ Open 2015;3:E166-71. Lazarus B, Chen Y, Wilson FP, Sang Y, Chang AR, Coresh J, et al. Proton pump inhibitor use and the risk of chronic kidney disease. JAMA Intern Med 2016;176:238-46. Xie Y, Bowe B, Li T, Xian H, Balasubramanian S, Al-Aly Z. Proton pump inhibitors and risk of incident CKD and progression to ESRD. J Am Soc Nephrol 2016. pii: ASN.2015121377. Courson AY, Lee JR, Aull MJ, Lee JH, Kapur S, McDermott JK. Routine prophylaxis with proton pump inhibitors and post-transplant complications in kidney transplant recipients undergoing early corticosteroid withdrawal. Clin Transplant 2016;30:694-702. Kieboom BC, Kiefte-de Jong JC, Eijgelsheim M, Franco OH, Kuipers EJ, Hofman A, et al. Proton pump inhibitors and hypomagnesemia in the general population: A population-based cohort study. Am J Kidney Dis 2015;66:775-82. Schlingmann KP, Weber S, Peters M, Niemann Nejsum L, Vitzthum H, Klingel K, et al. Hypomagnesemia with secondary hypocalcemia is caused by mutations in TRPM6, a new member of the TRPM gene family. Nat Genet 2002;31:166-70. Bai JP, Hausman E, Lionberger R, Zhang X. Modeling and simulation of the effect of proton pump inhibitors on magnesium homeostasis 1. Oral absorption of magnesium. Mol Pharm 2012;9:3495-505. Thongon N, Krishnamra N. Apical acidity decreases inhibitory effect of omeprazole on Mg(2+) absorption and claudin-7 and-12 expression in caco-2 monolayers. Exp Mol Med 2012;44:684-93. Nakashima A, Ohkido I, Yokoyama K, Mafune A, Urashima M, Yokoo T. Proton pump inhibitor use and magnesium concentrations in hemodialysis patients: A cross-sectional study. PLoS One 2015;10:e0143656. Hoorn EJ, van der Hoek J, de Man RA, Kuipers EJ, Bolwerk C, Zietse R. A case series of proton pump inhibitor-induced hypomagnesemia. Am J Kidney Dis 2010;56:112-6. Kao WH, Folsom AR, Nieto FJ, Mo JP, Watson RL, Brancati FL. Serum and dietary magnesium and the risk for type 2 diabetes mellitus: The Atherosclerosis Risk in Communities Study. Arch Intern Med 1999;159:2151-9. Orchard TS, Larson JC, Alghothani N, Bout-Tabaku S, Cauley JA, Chen Z, et al. Magnesium intake, bone mineral density, and fractures: Results from the Women's Health Initiative Observational Study. Am J Clin Nutr 2014;99:926-33. Khan AM, Lubitz SA, Sullivan LM, Sun JX, Levy D, Vasan RS, et al. Low serum magnesium and the development of atrial fibrillation in the community: The Framingham Heart Study. Circulation 2013;127:33-8. Liamis G, Rodenburg EM, Hofman A, Zietse R, Stricker BH, Hoorn EJ. Electrolyte disorders in community subjects: Prevalence and risk factors. Am J Med 2013;126:256-63. Tin A, Grams ME, Maruthur NM, Astor BC, Couper D, Mosley TH, et al. Results from the Atherosclerosis Risk in Communities study suggest that low serum magnesium is associated with incident kidney disease. Kidney Int 2015;87:820-7. Van Laecke S, Van Biesen W, Vanholder R. Hypomagnesaemia, the kidney and the vessels. Nephrol Dial Transplant 2012;27:4003-10. Maguire ME, Cowan JA. Magnesium chemistry and biochemistry. Biometals 2002;15:203-10. Baldoli E, Castiglioni S, Maier JA. Regulation and function of TRPM7 in human endothelial cells: TRPM7 as a potential novel regulator of endothelial function. PLoS One 2013;8:e59891. Banai S, Haggroth L, Epstein SE, Casscells W. Influence of extracellular magnesium on capillary endothelial cell proliferation and migration. Circ Res 1990;67:645-50. Salem S, Bruck H, Bahlmann FH, Peter M, Passlick-Deetjen J, Kretschmer A, et al. Relationship between magnesium and clinical biomarkers on inhibition of vascular calcification. Am J Nephrol 2012;35:31-9. Dong JF, Cruz MA, Aboulfatova K, Martin C, Choi H, Bergeron AL, et al. Magnesium maintains endothelial integrity, up-regulates proteolysis of ultra-large von Willebrand factor, and reduces platelet aggregation under flow conditions. Thromb Haemost 2008;99:586-93. Ravn HB, Kristensen SD, Hjortdal VE, Thygesen K, Husted SE. Early administration of intravenous magnesium inhibits arterial thrombus formation. Arterioscler Thromb Vasc Biol 1997;17:3620-5. Sakaguchi Y, Fujii N, Shoji T, Hayashi T, Rakugi H, Isaka Y. Hypomagnesemia is a significant predictor of cardiovascular and non-cardiovascular mortality in patients undergoing hemodialysis. Kidney Int 2014;85:174-81. Li L, Streja E, Rhee CM, Mehrotra R, Soohoo M, Brunelli SM, et al. Hypomagnesemia and mortality in incident hemodialysis patients. Am J Kidney Dis 2015;66:1047-55.